This species is accepted, and its native range is Ethiopia to S. Tropical Africa, SW. Arabian Peninsula. Sepals unequal, ovate to lanceolate, acute with black submarginal dots. Sepals unequal, ovate to lanceolate, acute with black submarginal dots. Petals 1.9–4.1 cm. long, bright yellow, with black marginal dots. Petals 1.9–4.1 cm. long, bright yellow, with black marginal dots. Stamens in 5 bundles of about 30 each. Stamens in 5 bundles of about 30 each. Shrub, 0.5–4.5 m. high. Shrub, 0.5–4.5 m. high. Young stems indistinctly 4-angled, soon becoming woody and terete. Young stems indistinctly 4-angled, soon becoming woody and terete. Leaves ovate-lanceolate, lanceolate, oblong-elliptic or oblanceolate, ranging from 16 × 6 mm. and 35 × 5 mm. to 72 × 27 mm. and 74 × 19 mm. (86 × 20 mm. ), acute or subacute, broad and cordate or subcordate and clasping at the base, furnished with two pairs of secondary veins (often inconspicuous), running very obliquely from near the base, anastomosing with a few less oblique secondaries in the apical half (tertiary veins and reticulation not noticeable) and many longitudinal linear not translucent glands, often inconspicuous, embedded below the upper surface, and black submarginal glands. Leaves ovate-lanceolate, lanceolate, oblong-elliptic or oblanceolate, ranging from 16 x 6 mm. and 35 x 5 mm. to 72 x 27 mm. and 74 x 19 mm. (86 x 20 mm. ), acute or subacute, broad and cordate or subcordate and clasping at the base, furnished with two pairs of secondary veins (often inconspicuous), running very obliquely from near the base, anastomosing with a few less oblique secondaries in the apical half (tertiary veins and reticulation not noticeable) and many longitudinal linear not translucent glands, often inconspicuous, embedded below the upper surface, and black submarginal glands. Styles 5, united up to the apex. Styles 5, united up to the apex. Rocky places, gulleys and river banks in upland grassland or deciduous woodland, 1150–2250 m. Rocky places, gulleys and river banks in upland grassland or deciduous woodland, 1150–2250 m.
Young stems 4-angled, soon becoming woody and terete. Leaves sessile; lamina 35–90 × 5–27 mm., ovate-lanceolate to oblong-elliptic or oblanceolate, acute or subacute at the apex, broadly cordate or subcordate and clasping at the base, with 2–3 pairs of nerves (often inconspicuous) running very obliquely from near the base and anastomosing with a few less oblique secondaries in the apical half (the anastomoses rarely extending nearer the base), without noticeable tertiary veins and reticulations but with pale longitudinal glands, mostly streaks or lines, often inconspicuous, embedded near the upper surface, and dark marginal dots. Sepals lanceolate (more rarely ± ovate), acute, with dark marginal dots. Petals, 1·9–4·1 cm. long, c. 3–4 times as long as the sepals, with dark marginal dots. Ovary 5-locular; styles 5, united ± to the apex, 8–13 mm. long. 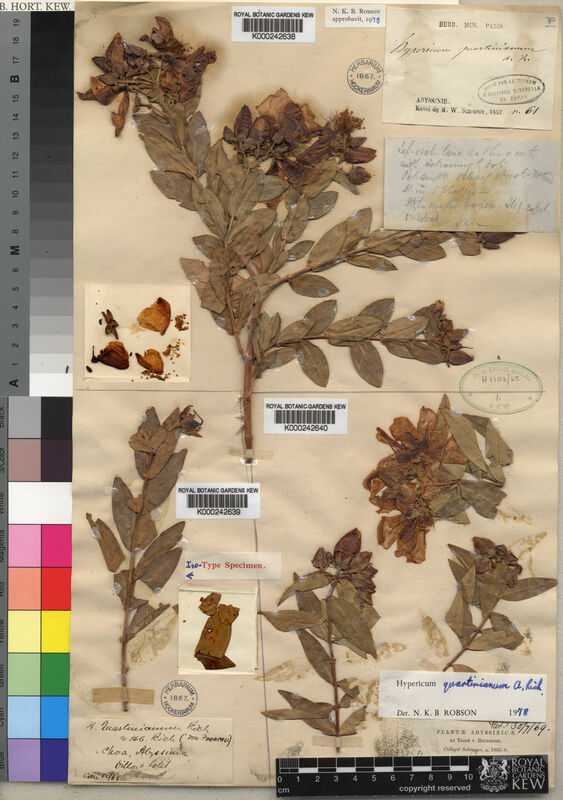 Hypericum affine Steud. ex Oliv. Bamps in Distr. Pl. Afr. 3, map 76 (1971). Moggi & Pisacchi in Webbia 22: 252, fig. 5, map 3 (1967). W.J. Eggeling, Indigenous Trees of the Uganda Protectorate, ed. 2, 157 (1952). Good in Journal of Botany 65: 332 (1927). A. Engler & O. Drude, Die Vegetation Der Erde, IX, Pflanzenwelt Afrikas 3 (2): 499 (1921), pro parte. Oliv. in Flora of Tropical Africa 1: 156 (1868), pro parte, excl. syn. Schimp. A. Rich., Tent. Fl. Abyss. 1: 97 (1847).